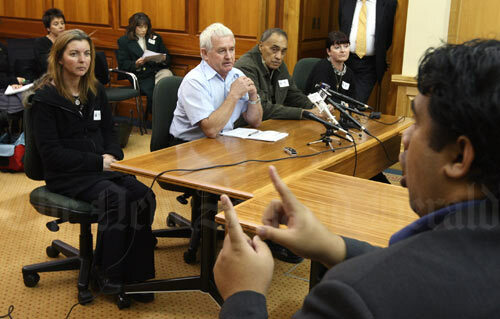 A sign-language expert interprets for Louise Agnew (left) as Garth McVicar (centre) of the Sensible Sentencing Trust speaks before Parliament's law and order select committee in 2009. McVicar, accompanied by crime victims Agnew, Tai Hobson and Susan Crouch, was making a submission to the select committee on the Sentencing and Parole Reform Bill. Interest groups and the public are able to make submissions on bills during the select-committee stage after the first reading. Sign language is one of New Zealand's official languages and is used in parliamentary proceedings as required.